Part of the Golden Week holiday, Greenery Day represents a day to show appreciation of nature. Greenery Dayみどりの日・みどりのひ is celebrated as a day to commune with nature and be grateful for its blessings. Originally established in 1989 and held annually on April 29 until 2007 when it was renamed 昭和の日しょうわのひ・Shōwa Day in remembrance of the Show Emeperor Hirohito’s love of plants. Greenery Day in Japan falls in the middle of ゴールデンウィークGolden Week, one of the longest holiday periods in Japan running from the 29th of April to the 5th of May. Warm weather solidifies its hold on the land from this time, temperatures tend to be very pleasant and 晴れはれ・sunny weather prevails. Golden Week is also 米こめ・rice planting season and when the first crop of 緑茶りょくちゃ・green teais harvested. 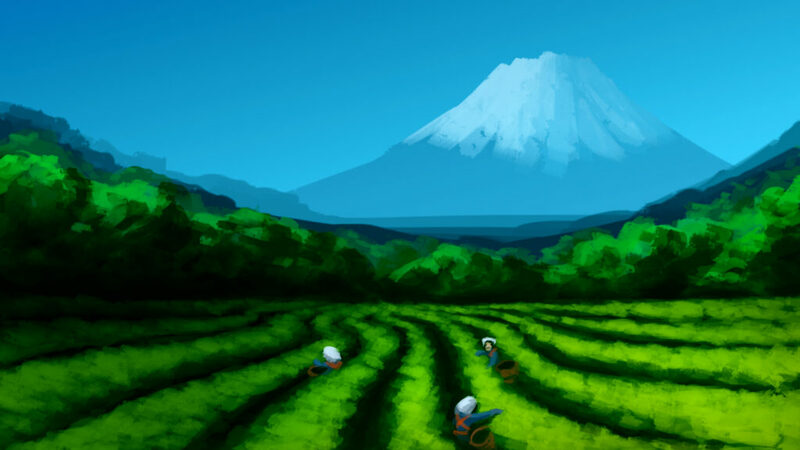 Known as ichibancha一番茶・いちばんちゃ this first picking of green tea is widely regarded as the tastiest of the three yearly pickings (the other two pickings, nibancha二番茶・にいばんちゃ and sanbancha三番茶・さんばんちゃ occur in July and September). Going to a 庭園ていえん・garden or a tea room for a 茶道さどう・tea ceremony will grant you the chance to try the best green tea on this day celebrating all things green.